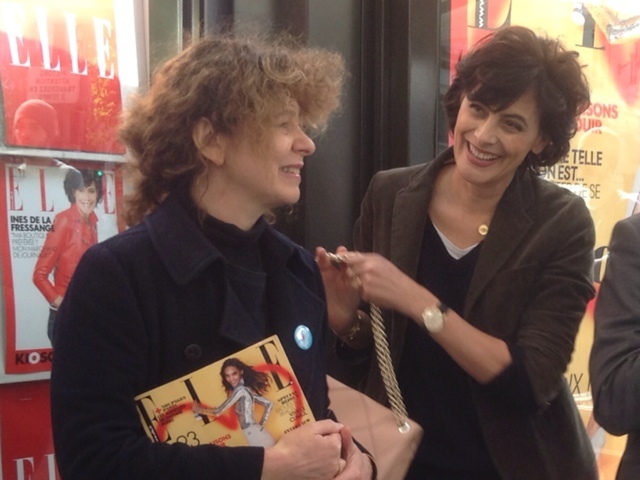 Samdi 20 Avril Paris ♥ ses Kiosques By chance I ran into Ines de la Fressange. Her child-like joy was infectious. 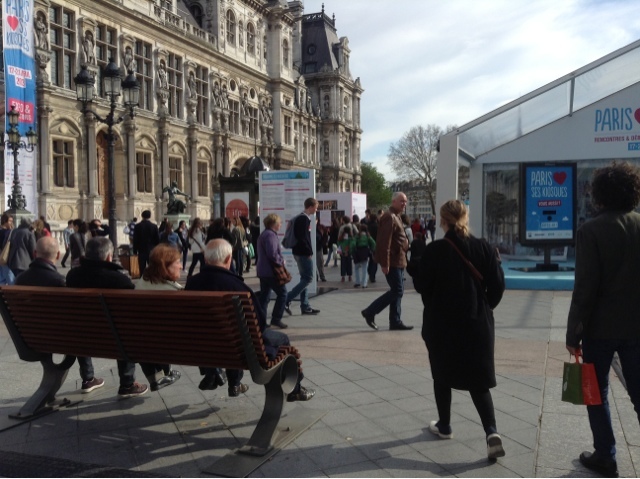 The occasion was the celebration of 150 years of Kiosques in Paris. 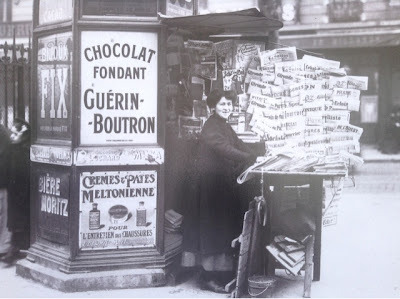 With wonderful old photos of original Parisian Kiosques. 'Ohhh, she must put those big curlers in her hair too create the big volume and used some Elnett hairspray to make it hold'! Speaking of great beauties I had just come out of Pierre Herme, rue Bonaparte after blowing my week's allowance on his new gorge 'Celeste' series..well on this verrine and one Celeste macaron. Compote de rhubarbe aux fraises, fraises fraîches, crème de mascarpone au fruit de la Passion, guimauve au fruit de la Passion. Dans ce verre, toute une expérience, celle d’y plonger la cuillère pour en extraire une belle bouchée fruitée. 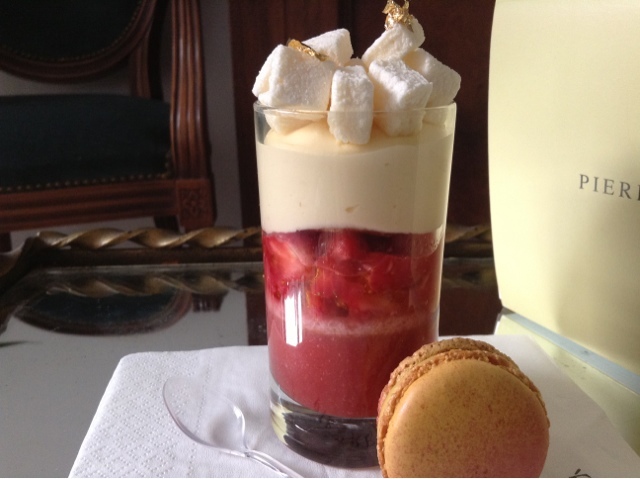 Une superposition de goûts autour des trois saveurs de Céleste déclinées sous forme de compote de rhubarbe à la fraise, de fraises fraîches, de crème de mascarpone et de guimauve au fruit de la Passion. 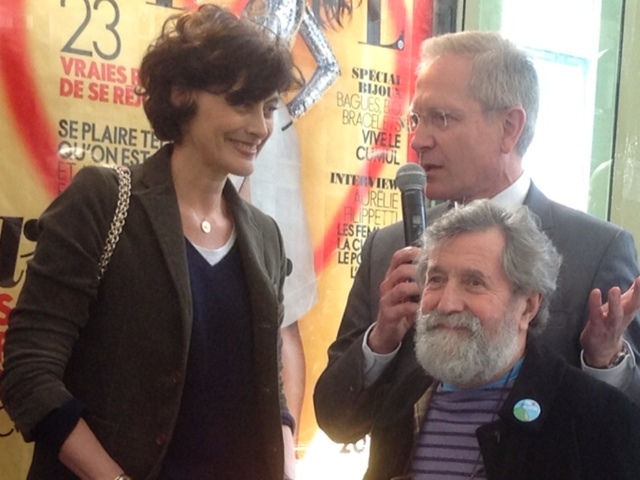 L’émotion Céleste. Ou comment la note intense du fruit tropical vient sublimer le côté fruité du mélange fraise et compote de rhubarbe. 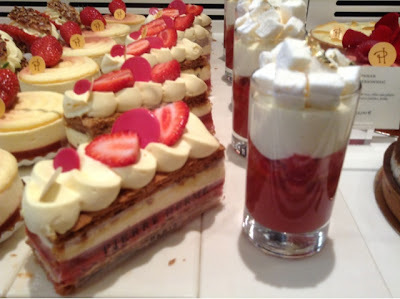 Translation - a divine combination of strawberries, rhubarb, passion fruit and marscapone = heaven. It takes an artist to think of other artist's needs. The verrine's packaging is the perfect secure holder for your waterglass when painting. Merci Ines, Celeste et Paris ♥ ses Kiosques! SOS I need Twitter lecons! She's magnetic! Charismatic:) I can tell..and her legs? Looks quite gorgeous what you ate.. I found a very pretty cake roll adorned with macarons..since I seem to have gotten the trick..I may make one..
Oh, what a great way to spend a samedi! You have these wonderful adventures, and we get to read about them. Perfect! You really are living the Life!!! Fantastically photogenic woman!! Why is it so easy to look at beautiful people and believe their lives are perfect? I'm watercoloriste japanese who live in Paris. It's good idea.I'd like to go chez Pierre Herme for only get this package. Merci Erieri for stopping by PB. Ines = adorb: emphatically yes! She is very attractive and ebullient! 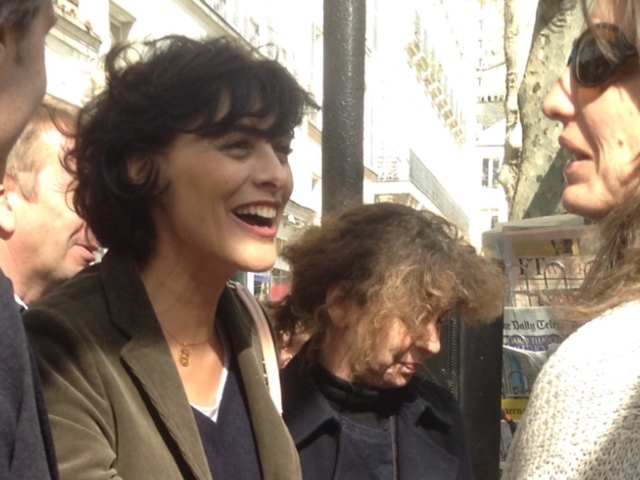 Carol, there is something so lively about the lovely Ines. She seems so free of intent or posing. Her coiffure seems natural, no matter how many minutes her stylist took in touch up snipping. 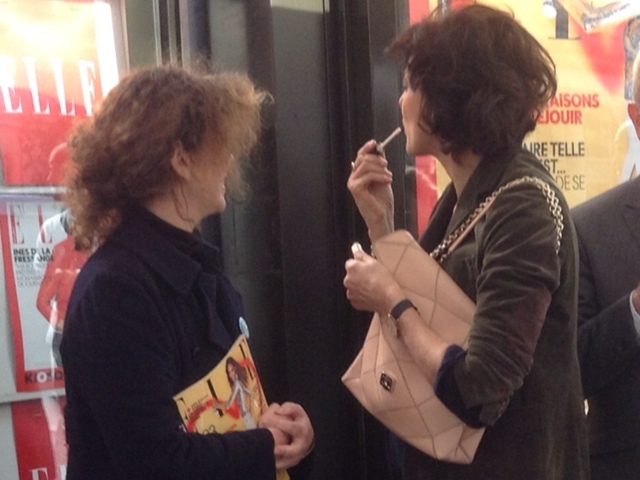 I love the photo of the lippy application. Which brand do you think she uses? 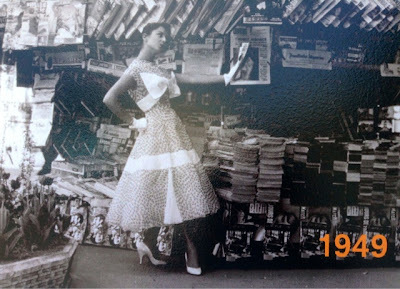 Meanwhile, back at les kiosques...aren't they wonderful, and so well worth a tribute. And quite wonderful that you were there with your camera or tablet of whatever it was that allowed you to show us these photos. Oh...the pastries look rather good, too. It was a wand type.. I would love to know so I can run out and buy the same one! The whole blog was just "YUMMY"! Lucky you - Ines is a natural beauty and fun to watch as she seems so comfortable in her skin. Absolutement 'Bein dans sa peau'! You see lots of gorgeous women who are famous but they look like they know how to smile and are just doing what they know. She looks like she knows how to live and is doing that -- and because of it, looks incandescent. 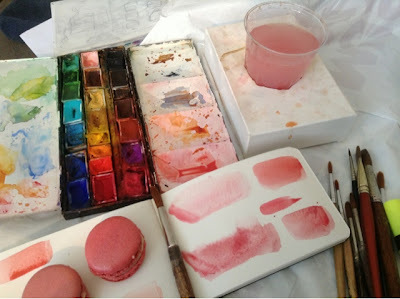 LOVE that last picture with the painting and verine and macaron. Love it most! Beautiful pictures, Carol. 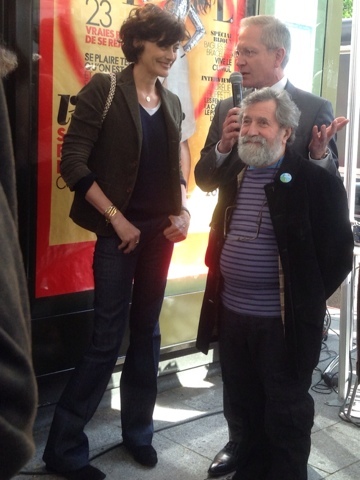 Inès is a total class act, beautiful, gracious, with a great sense of humor and not full of herself. For me she incarnates "joie de vivre". And it looks like you've got a good dose of it yourself! Harriet Welty Rochefort, author, "Joie de Vivre"
Fun, Carol! She looks just as I imagine her. But she probably saw you and thought, "who is this Charming American artiste?...must be that wonderful Carol Gillott I hear so much about." she is one of my idols!! Wow,Ines looks amazing in your pics. Did you really just run into her on the street? Mimi Pompom PS: most jealous you have been eating caviar. Wish I could have looked like she does when I was young!! She looks so natural. If I'd been photographed in a T/shirt & Jkt with my sleeves pushed up my arms, I'd look as if I was ready to wash dishes. I adore natural beauty. What a great day you had, only problem was you weren't close enough to get the manufacturers name if the lippy. Great post. What an elegant and amazing woman! Carol, this post was wonderfully inspiring! LOVE Ines! "Parisian Chic" is my style bible. That V-Neck Navy sweater she's sporting in your photos is just perfect.